CGCC and the Intergovernmental Authority on Development (IGAD) Capacity Building Program Against Terrorism (ICPAT) cohosted a seminar on investigating terrorism incidents for more than 50 law enforcement, intelligence, security, and prosecutorial officials from Djibouti, Ethiopia, Kenya, Somalia, Sudan, and Uganda, as well as representatives from South Sudan and Somaliland. The seminar provided a unique opportunity for officials from around the subregion to engage with their counterparts and meet with foreign experts. 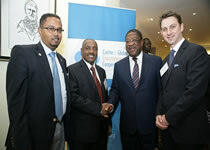 Participants discussed the current status of efforts to ratify and implement the IGAD Extradition and Mutual Legal Assistance Conventions and expressed strong support for increased efforts at the national level and for the promotion of a discussion about how to strengthen rule of law–based counterterrorism cooperation at the subregional level. Participants explored the importance of effective cooperation by examining lessons learned from the investigation of the 1998 Kenya and Tanzania embassy bombings; the 1998 Omagh bombing in Northern Ireland; the 2002 Kikambala/Paradise Hotel attack; and the 2010 Kampala bombings. The seminar examined the topics of leadership, community engagement, financial investigations, information sharing and interagency coordination, and protection of human rights.